Now that I’ve actually managed to find a few hours before I’m obliged to do anything (except, of course, getting keys cut, tying up the boxes in the back for recycling and mailing off a package), I’m looking to get a decent blog post put together. So yes, character creation – how the heck do I do it? Oftentimes, I’ll come up with ideas for my comic, Fish & Chimps (which I really do hope to start re-releasing sometime soon) where I haven’t figured out what characters will be used, or even if they exist as of yet. Without spoiling too much of my story or thinking, let’s observe one character I’ve come up with recently – it’s one that’s still in the works, so if anyone has anything to say on it, feel free. 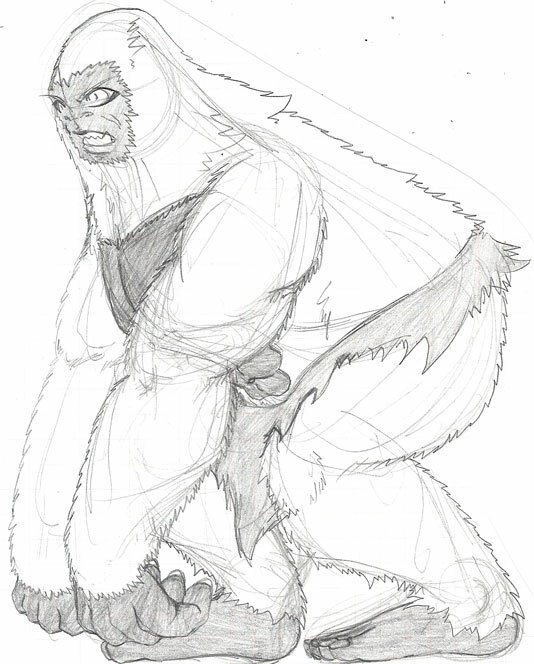 There’s a situation later on into FNC where I need Yeti-like creatures in order to better develop a key character. I wanted them to look extremely powerful and somewhat aggressive, but also like they could be their own race with their own culture, etc. I didn’t want them to just seem like your basic enemy threat, something that’s only around to be defeated by the protagonist. So, since this is based on a Himalayas-like mountain range, what do I know? So, keeping all of this in mind, I went to work. I think this exercise was likely the epitome of the statement you see on all those infomercials for self-help products – results may vary. 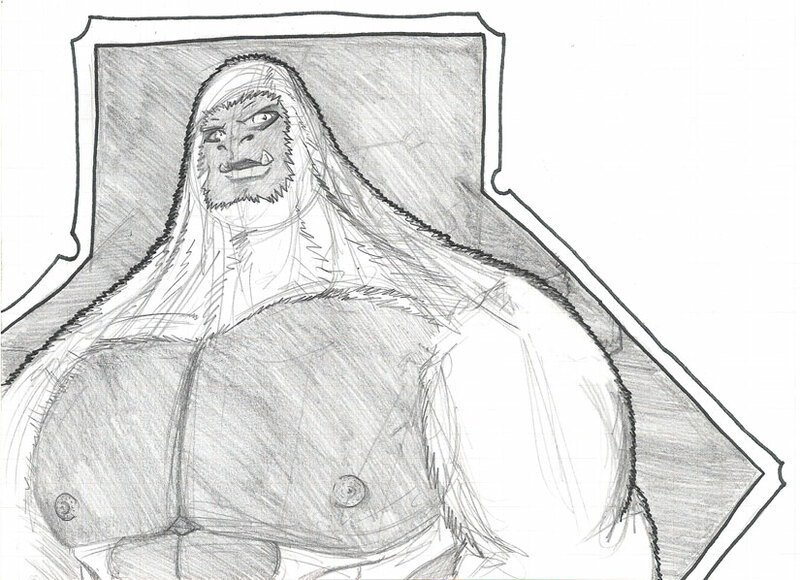 I figured that the most powerful primate that I’d thought of using in my series so far was a gorilla, so I decided to base the Yeti design around that. 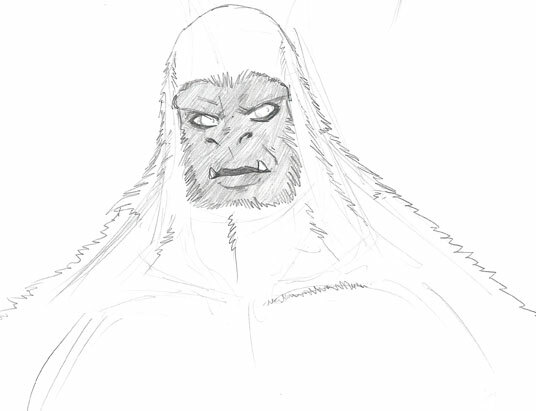 Taking a look at G, my gorilla character, I decided to start basing the Yetis around him. Third attempt: Really starting to figure out how big and powerful these things will be. I thought I’d really hit the nail on the head here and asked a couple of co-workers if it reminded them of a Yeti-like being. They said yes, BUT the posture was way too humanoid. Attempt cuatro: This is where I’m at for now. In the end, I ended up with a more primal version of what I’d come up with on my third attempt, and that’s okay with me for the time being. As I get more comfortable with the character, I’d likely draw group scenes with males, females and children to get a better idea of what they look like, how they interact, their size relative to others, etc. So I hope that gave a little bit of insight into how I go about creating characters for use in FNC, and now I’ll open up the floor to questions and comments.